"The Mac mini has been implanted into robots, slapped onto a Plasma, slammed into a PC drive bay, and of course mounted in your car's dash . . . and now it's friggin' disappeared into the iKitchen. The goal here was to 'install a computer in the kitchen, hidden, and with few to no visible cables.' 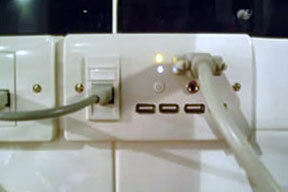 A standard UK double-socket faceplate was hacked with the mini's power button, status lights, and ports all fed via extension magic from the mini mounted under the kitchen unit. Most useful tool: blunt table knife, a.k.a. lever or impromptu screwdriver. Ahhh modders we justs loves 'em." "The NewerTech miniStack has been chosen as our Mac mini accessory of the year. Other finalists included the LaCie mini, Belkin Hub for Mac mini, Pressure Drop zStand, and Plasticsmith miniTower. There are several features that make the miniStack stand out from the crowd, including price, quality, functionality, and performance. We also appreciate the number of different configurations offered, software bundle, and two-year warranty. 'NewerTech has always put quality and functionality first,' said Larry O'Conner, founder of NewerTech. 'We are pleased to find this separated the NewerTech miniStack to be above the rest.'" PR: FastMac and MacMod.com have teamed up to showcase a variety of custom Mac mods at the upcoming Macworld Expo in San Francisco, CA. The mods will be available for viewing at the FastMac booth (#827) during the Expo (January 10-13th) and will include the 2005 Great Mod Challenge Mod of the Year, the Real Wood iPod. Other mods on display will include: the iTablet, a FastMac Powered Liquid Cooled Server, Wallstreet Road Warrior, Necronomicon PowerMac, and Evangelion Mac Mini. "Macworld is a great opportunity to show off all the cool things that can be done with a Mac and support the Modding community" said Michael Lowdermilk, Business Development Manager for FastMac Performance Upgrades, Inc. "And don't forget to stop by our website and receive a free Macworld Exhibit Hall Pass so you can check these Mods out without paying a dime." "It's a great time for the Mac modding community" said Anthony King, cofounder of MacMod.com "Even Apple has acknowledged the coolness factor that modders can add." For details on how to receive your free exhibit hall pass including priority code simply visit the FastMac website. PR: The Bluetooth Firmware Update 1.2 improves Bluetooth performance and reliability issues. When the update package is downloaded, the Bluetooth Firmware Updater application will be launched. Follow the on screen directions to update your Bluetooth Firmware. PR: Belkin announces its new CableFree USB Hub, the industry's first USB Hub that does not require a cable to connect to the computer. This Hub allows people to place their laptop anywhere in the room while still maintaining wireless access to their USB devices, such as printers, scanners, hard drives, and MP3 players. This is the first UWB-enabled product to be introduced in the U.S. market. The CableFree USB Hub's wireless functionality is enabled by Freescale Semiconductor's (NYSE:FSL) (NYSE:FSL.B) Ultra-Wideband technology. CableFree USB will be on display at the 2006 International CES Show in Las Vegas, NV, January 5-8, at 31247 South Hall and at Macworld Conference & Expo in San Francisco, CA, January 10-13, at 717 South Hall. Beginning in early spring 2006, Belkin will offer a four-port hub that will enable immediate high-speed wireless connectivity for any USB device without requiring software. The CableFree USB Hub gives desktop computer users the freedom to place their USB devices anywhere in the room without running long cables. Laptop users gain the freedom to roam wirelessly with their laptop around the room while still maintaining access to their stationary USB devices. Belkin's CableFree USB product will be compatible with the more than 700 million USB devices estimated to be in the market today. Indeed, according to market research firm In-Stat, the number of USB devices is forecast to increase to 2.1 billion in 2009. "We have always focused on ease of use when developing our products," comments Mark Reynoso, Sr. VP of Sales and Marketing for Belkin. "With the proliferation of USB devices and the increasing demand for wireless functionality, it's important that we not only continue to bring innovative wireless products to the marketplace, but also to bolster them with easy installation. With CableFree USB, you can now get the ease of USB without wires." "These CableFree USB products represent innovative technology, but, more importantly, will extend the capabilities of millions of USB products," says Martin Rofheart, Director of the UWB Operation at Freescale. "With the convenience of Belkin's Plug-and-Play solution, consumers will not be burdened by software upgrades in order to achieve wireless functionality for their USB devices. Indeed, Belkin is taking a leadership role in bringing true wireless USB to the market, and we are thrilled to work with them on this initiative." Freescale's UWB solutions enable high rate transfer of video, audio, and data streams wirelessly. At rates 100 times faster than Bluetooth(TM) technology and with wire-like quality, UWB brings a new wireless option to auto, consumer electronics, and PC/peripheral manufacturers. Using UWB, for example, an MPEG2 movie or HDTV stream can be broadcast in real time wirelessly. This allows consumers new freedom in the use of multimedia-centric products, as they no longer need to be connected with wires. Belkin products are available through Belkin as well as through a network of major distributors, resellers, and superstores. PR: Logitech, manufacturer of cordless computer peripherals, has introduced the Logitech Cordless Desktop S 530 Laser for Mac, a cordless keyboard-and-mouse combination that accentuates the elegant simplicity and style of today's best-selling Mac computers and provides premium controls to enhance the experience of using a Mac. "Apple's Mac computers consistently deliver premium style and experience - and our new desktop expertly complements those attributes," said Denis Pavillard, Logitech's vice president of product marketing for desktops and keyboards. "We've applied our award-winning design process to develop a minimalist, slim design to match the Mac. Our keyboard delivers important additional controls that improve the digital media experience and our revolutionary laser mouse technology provides exceptional precision." The Logitech Cordless Desktop S 530 Laser for Mac is a stylish upgrade from a standard keyboard and mouse and the perfect addition for products such as the Mac mini, which isn't sold with a mouse or keyboard. The keyboard and mouse are soft white with silver accents, matching the coloring of the Mac. The sleek, ultra-flat keyboard is less than 3/4 inches (19 mm) high, serving an ergonomic purpose by minimizing wrist extension. To further increase the comfort of the user, the keyboard also includes a large built-in palm rest. The keyboard features all the standard Mac keys and two narrow panels, one on each of the right and left sides, with 15 additional buttons that make it easy to launch and navigate digital media and the Internet, and to open documents. One-touch media buttons on the right side of the keyboard help people control music and playlists within iTunes, and launch the iPhoto application and the Mac Spotlight search feature. People can use buttons located on the left side of the keyboard to launch an e-mail application, and to efficiently scroll through documents and the Internet. Though all of these buttons have preset functions, they can also be customized with the included Mac-specific Logitech Control Center software. The sculpted mouse tracks accurately on virtually any surface and enables pixel-precise editing in photo and graphics applications, thanks to Logitech's high-performance laser tracking technology. The innovative Logitech tilt wheel design allows people to scroll through documents and Web pages from top to bottom or side to side. Five customizable buttons on the mouse allow people to control volume, and to move forward and backward in a Web browser without moving the mouse. The sculpted mouse follows the natural shape of the right hand, providing a comfortable grip. Logitech's battery management technologies provide a battery life of up to six months on both the mouse and keyboard. The keyboard and mouse feature convenient battery-level indicators that flash when approximately 10 days of battery life remain. The mouse features an on/off switch to further extend battery life. The Logitech Cordless Desktop S 530 Laser for Mac features a USB mini-receiver that plugs directly into a Mac's USB port. It's easy to unplug the mini-receiver and mouse for use with a PowerBook or iBook, around the house or for travel. The Logitech Cordless Desktop S 530 Laser for Mac will be available in February in the U.S. for a suggested retail price of $99.99. In Europe, the desktop will be called the Logitech Cordless Desktop S 530 Mac and will be available in March. 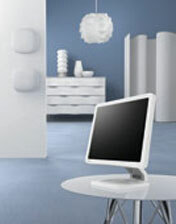 PR: Designed to convey a simple elegance, the BenQ FP93V's all-white exterior is embellished with a lustrous finish. Further more, its pristine appearance is further enhanced by its clean lines and sleek contours, highlighted by a unique base stand. Exquisite on its own, the BenQ FP93V also perfectly complements any decor. More than just a great looker, the BenQ FP93V provides handy design touches like two helpful ways to manage cable clutter. The base stand offers a perfect storage possibility to keep your stationery, an external drive or media player, or even a small PC system. Equipped with both traditional D-Sub and next-generation DVI input support, the FP93V provides the best possible picture quality and video performance regardless of whether you are working with analog or digital input. The BenQ FP93V excels in performance, with an exceptionally fast 8ms response time, ensuring no ghosting or trailing effects, even in demanding applications such as DVD playback or gaming. With a 550:1 contrast ratio and 270 cd/m2 of brightness, the FP93V delivers crisp and easily viewed images and text even in brightly lit environments. 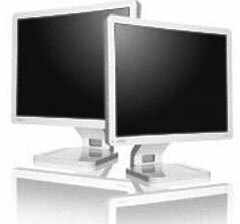 To ensure optimal viewing and comfort, the FP93V's screen's position and tilt can be easily adjusted. PR: LaCie brings New Year cheer to its loyal customers with six new storage products designed to help people easily manage their digital lives. LaCie has again teamed up with world-renowned designers including Neil Poulton and Karim Rashid, and award-winning tech companies such as LightScribe and Roxio, to develop the freshest new hard drives and DVD burners on the market. New products will make their debut at Macworld Expo in San Francisco's Moscone Center from January 9-13. Visit LaCie Booth #2143 for a hands-on look. LaCie will also offer special Macworld pricing on its most popular hard drives for a limited time via the LaCie Store Online or direct at 503-844-4502. And stay tuned for the launch of a brand new "Customer Profiles" web page that showcases how filmmakers, photographers, musicians and many others are using LaCie products to get things done. LACIE LITTLE BIG DISK: The most powerful portable hard drive ever in unrivaled capacities for portable storage of 320 GB and unprecedented throughput of up to 80 MB/s over FireWire 800 (burst transfer rate). Equipped with LaCie's flagship Triple Interface (FireWire 800/400 and USB 2.0), Little Big Disk is perfect for audio/video pros that require superior speed, mobility and capacity on the road. It's powered by and bootable over FireWire making it the ideal candidate for a fully portable editing workstation and companion to Apple PowerBooks. Little Big Disk also comes in a LaCie signature design by Neil Poulton, creator of the original d2 Hard Drive Series. creation. This exclusive creation of world-renowned designer Neil Poulton packs LaCie reliability into a hard drive that works hard and plays harder. Also available in Single Interface of USB 2.0. LACIE SKWARIM: A stylish handheld for those who want a portable hard drive to match their mood. Skwarim (pronounced square-im) was designed by the world renowned Karim Rashid with clients ranging from Umbra to Prada, Miyake to Method. Skwarim comes in an electric blue 60 GB or dazzling pink 30 GB version and has a 3.3" perfect square shape with a unique textured feel. Has an integrated Hi-Speed USB 2.0 cable for instant plug-and-play use without the need to carry a cumbersome AC adapter. LACIE TWO BIG: An ultra-fast SATA II RAID solution for with two hot-swappable drives in capacities of 500 GB or 1 TB. It delivers maximum speed of up to 115 MB/s in RAID 0, large capacity and redundancy options at an affordable price. Simple setup makes it easy to just plug-and-play, and drives are hot-swappable for future expandability. Bundled with the LaCie SATA II 3 Gb/s PCI-X Card 4E that has four ports for adding multiple LaCie Two Big RAID units for increased speed and capacity. Works with PC and Mac. LACIE MINI HARD DRIVE & HUB: An all-in-one storage solution designed to expand use of the Apple Mac mini. Has enough storage space (up to 500 GB) to accommodate a growing collection of videos, music files or images, and (2) FireWire 400 and (4) Hi-Speed USB 2.0 ports to accommodate a variety of additional peripherals such as printers, digital or video cameras, or additional LaCie hard drives. It's the ideal sidekick to a Mac mini with its matching brushed aluminum casing and identical form factor. While Apple's iLife '05 helps people manage their multimedia files, LaCie's mini Hard Drive & Hub gives users the freedom to expand their multimedia libraries. LACIE SLIM DVD+-RW DESIGN BY FA PORSCHE WITH LIGHTSCRIBE AND TOAST 7 TITANIUM: A fully portable FireWire bus-powered DVD burner with powerful Toast 7 Titanium CD/DVD burning software, which includes a new set of multimedia-specific features such as converting DivX downloads to DVD in one step, creating HD slideshows, and burning over 50 hours of music onto a single layer DVD with Dolby Digital sound. LaCie Slim DVD+-RW Design by FA Porsche also has the ability to etch silkscreen-quality labels onto special discs using LightScribe technology. It can write to all CD/DVD media formats and comes in ultra slim casing created by Porsche Design GmbH for true mobility. At Macworld Expo LaCie will give away a different LaCie prize every day, so stop by with a business card to be entered in the drawing. Winners will be randomly chosen at the end of each day and need not be present to win. New to our booth this year is the "Expert Panel" reception area that will be manned by two of LaCie's technical experts who can help customers get the most out of their LaCie hardware. New products will be on display with a focus on LaCie's unique history of working with world-renowned designers such as Neil Poulton, Porsche Design GmbH, Orato and more. PR: At the 2006 Consumer Electronics Show, Seagate Technology is introducing innovative consumer products that add benefits and functionality to already proven Seagate consumer product lines. The Seagate Portable Hard Drive will boost storage capacity to 160 GB, which is 30% over the current standard while maintaining the same compact footprint. For data-intensive applications such as video editing or massive data transfers, the Seagate Pushbutton Backup Hard Drive now backs up and transfers data five times faster than existing storage devices, by taking 3 Gb/s Serial ATA out of the box. "Our storage innovations are driving the infusion of exciting new capabilities into applications of all kinds, from the home to the office to the road and beyond," said Jim Druckrey, general manager, Branded Solutions. "We design and deliver products that will help consumers make the most of their active digital lifestyles, whether they are at work, play, for entertainment or learning." The Seagate 160 GB Portable Hard Drive is the industry's first portable drive built with perpendicular recording, an innovative technology that Seagate has employed to deliver the market's highest capacity in a 2.5" form factor. The new portable hard drive provides 30% more capacity than comparably sized drives. The 160 GB Portable External Hard Drive enables users to carry a massive array of business files, digital music, digital photos, digital videos and games in a package that weighs less than one pound. Engineered to be taken on the road, the Portable Hard Drive features a robust internal shock-mounted design and aluminum alloy enclosure to protect from drops and falls. Additionally, it is powered through the computers' USB port, eliminating the need for a power cord; delivers up to 480 Mbps, optimal for transferring huge amounts of data; and is Macintosh and PC compatible. The Portable External Hard Drive also includes the award winning Bounce Back Express software used in Seagate's desktop storage solutions, making backups easier and faster than ever. Back-up or transfer Important Files Up To Five Times Faster The Seagate 500 GB eSATA Pushbutton Backup Hard Drive provides external data backup and protection with speeds up to a 300 MB/s or 3 Gb/s interface rate - up to five times faster than existing external storage solutions such as USB 2.0 and 1394a. Seagate eSATA Pushbutton Back-up hard drives are advanced, high speed solutions for desktop systems, entry servers or digital video work stations needing fast, reliable single drive speed or even faster, larger, multi-drive capacities. With 500 GB of capacity, the newest Seagate Pushbutton Backup Drive is capable of holding up to 8,330 hours of digital music, 160,000 digital photos, 500 hours of digital video and 250 exciting games. PR: Cornice Inc. has announced the expansion of its storage offerings with the addition of an ultra thin, high-capacity personal storage device. The Cornice Dragon series micro hard drives, available in 8- and 10-gigabytes, will allow OEMs to offer thinner and higher-capacity consumer electronics (CE) devices while featuring industry-leading robustness, durability, and low power requirements for everyday consumer use. Audio/video players, mobile phones and personal storage devices will all be enhanced by the Dragon series micro hard drive. By narrowing the casing around the disk and by shrinking the "z" height, Cornice was able to produce the smallest and thinnest drive on the market - a necessity for next-generation, high-capacity mobile phones, audio/video players and personal storage devices. The Dragon series drives are 40-percent smaller than its predecessor, Storage Elements, as well as current competitive drives. Cornice's unique architecture is designed from the ground up and exclusively for CE devices. By focusing only on components required for the CE market, Cornice has created a disk drive solution that is streamlined specifically for these pocketable products. At 8-gigabytes today, and 10-gigabytes in the near future, Cornice is firmly in the leadership position for storage density. In response to enduser endurance demands, Cornice has decreased the power of Dragon by half, and now represents only five percent of the total battery consumption within a typical MP3 player system. "Through our strong strategic customer relationships, we've learned that portable consumer storage markets not only require a very small and thin form-factor, but they also require low power storage solutions rugged enough to meet the stringent consumer usability requirements," said Camillo Martino, Cornice's president and chief executive officer. "The Dragon series micro hard drive is Cornice's answer to our customers' needs and demands and a result of focusing our storage solutions for portable consumer electronics. The market opportunity for this type of storage is growing rapidly and Cornice is in a prime position to capture a large long-term market share." Cornice technology ensures that consumer electronics devices will provide continuous and uninterrupted playback even during today's most active lifestyles. The new Dragon series drives are protected by Cornice's rugged design, Crash Guard(TM), and can withstand excessive shaking, extreme drops, and other abuse without skipping, stopping, or crashing. Active Latch - When dropped, the most common damage to a hard drive occurs when the head scrapes across the surface of the disk (not unlike the needle scratching across an old vinyl LP record when the turntable was bumped). Cornice securely locks the head in place with an active latch mechanism. Skip Control - Hard drives are going places they have never been before - jogging, 4-wheel driving, skydiving - and are expected to operate even with excessive and repetitive motion. Cornice designed the Dragon series drives from the ground up to withstand the most extreme conditions while providing continuous playback without skipping or restarting. Drop Safe - This feature in the Crash Guard family allows the drive to actually sense being dropped. This means that even if the drive is in the middle of reading or writing data to the disk, it can immediately react and place the head safety under the active latch well before the unit actually strikes the ground. Cornice will be showcasing the new Dragon Series storage at the International Consumer Electronics Show from January 5-8, 2006, at the Las Vegas Convention Center (South 4 Hall, booth 35579). The Dragon Series drive is available in volume quantities in Q1. List price is $85 per unit in quantities of 10,000 per year. Email Cornice's sales staff at sales@corniceco.com or call 303-651-7291. PR: Cornice Inc. has announced the smallest-ever hard drive-based personal storage reference design, which incorporates the Company's new storage offering - the Dragon Series 8-gigabyte micro hard drive. This reference design, called Dragon Tail, allows consumer electronics (CE) OEMs a faster time-to-market option and the expertise and knowledge of the Cornice design team. Dragon Tail brings the convenience of a USB stick and the huge capacity of external hard drive storage together in a device that can now truly be carried around comfortably in your pocket. Cornice's engineering team, responsible for dozens of integration projects in MP3, mobile phones, GPS, personal storage, and video products, has applied all that expertise resulting in the optimum solution for USB storage. The relentless focus on ruggedness, durability, usability, and size has resulted in a truly unique product that can retail for about $18.50 per gigabyte - four times cheaper than Flash's $80 per gigabyte retail price point. Dragon Tail, roughly the size of a matchbook, is designed to withstand the extreme abuse of daily operation in a pocketable environment and operates exactly like the popular Flash based USB sticks but with at least four times the capacity at the same price point. That enables whole new uses beyond the simple "share your PowerPoint file with your coworker." Without the capacity and write speed limitations of Flash, computer backup, complete MP3/Video library storage, picture storage from digital cameras, and even home/work computer synchronization is now possible. Larger capacity at an affordable price opens up a whole new world of consumer usage models that will be exploited by Cornice's OEM customers. "High-capacity storage in a package that can be easily carried around in your pocket will change the way people use portable storage," said Steve Haddad, GM of personal storage for Cornice. "The increasing infusion of digital media into daily life is creating a demand for storage that Flash devices cannot fill. Since many of the HDD-based portable storage devices currently on the market are too large to carry around in your pocket and too expensive, they have been relegated to the under the counter niche product section in local electronics stores - Dragon Tail changes that." The Dragon Tail reference design is available now and is priced at $10,000 for the complete manufacturing design data plus 25 samples for qualification. Email Cornice's sales staff at sales@corniceco.com or call (303) 651-7291. PR: In Mac OS X 10.4 Tiger, the default message format for Mail messages changed from the Apple custom mbox-package format to the new emlx format (where messages are stored in individual files for Spotlight indexing). However, if you need to recover from a hard drive crash, it's almost impossible to recover your mail messages easily since Mail won't import emlx files and you can't add them to your mailboxes any other way. To use the tool, drag your emlx files into the main window. Click the "Save mbox..." button and a prompt will appear, allowing you to save an mbox file. Version 1.0.3 improves performance and now supports "partial" emlx files. PR: Don't sell a man a fish when he really needs to know how to fish himself or you're ripping him off. Then too, there are times when he needs you to throw him a line. The CLIX package includes a starter command database with over 1,000 (yes, you read that right) system commands for investigating your system status, for cleaning out the junk files, for getting at secret settings for the Dock, the Finder, Spotlight, Dashboard, Exposé, and all of your most used applications, and all sorted for easy access, any way you wish. Unlike other systems, CLIX is 100% WYSIWYG. What you see is what you get: exactly the command lines you would use at a terminal if you were so inclined. CLIX comes with commands for viewing all your system logs, for cleaning out browser caches, for pruning 'plist' preference files, for spelunking in root's back yard, for ridding your system of all kinds of junk, for seeing what your virtual memory is up to, what your Netinfo database manager is up to, and more, and more, and more. 'ligaz' has two 'help' systems for quick access to Unix 'manpage' information: one built in, the other an interface with the ManOpen application. Full details included in the package.